A suspension type string insulator consists of a number of porcelain discs connected in series through metallic links. Suspension insulators or string insulators are very widely used in electrical overhead transmission system. However, there is a significant thing to be considered in case of these string insulators, known as string efficiency. The figure below shows a 3-disc string of suspension insulator. As each porcelain disc lies in between two metal links, it forms a capacitor. This capacitance is known as self-capacitance or mutual capacitance. Moreover, air capacitance is also present between metal links and the earthed tower. This is known as shunt capacitance. The figure below illustrates the equivalent circuit of a 3-disc suspension insulator (assuming that shunt capacitance is some fraction of self-capacitance i.e shunt capacitance = k * self-capacitance). If there were only mutual capacitances, then the charging current would have been the same through all the discs. In this case, the voltage would have been uniformly distributed across the string, i.e. voltage across each disc would have been the same. But, due to the shut capacitances, charging current is not the same through all the discs. from the above equations (i), (ii) & (iii), it is clear that the voltage across the top disc is minimum while voltage across the disc nearest to the conductor is maximum, i.e. V3 = V1 (1 + 3k + k2). As we move towards the cross arm, voltage across the disc goes on decreasing. Due to this non-uniform voltage distribution across the string, the unit nearest to the conductor is under maximum electrical stress and is likely to be punctured. As explained above, voltage is not uniformly distributed over a suspension insulator string. The disc nearest to the conductor has maximum voltage across it and, hence, it will be under maximum electrical stress. Due to this, the disc nearest to the conductor is likely to be punctured and subsequently, other discs may puncture successively. Therefore, this unequal voltage distribution is undesirable and usually expressed in terms of string efficiency. 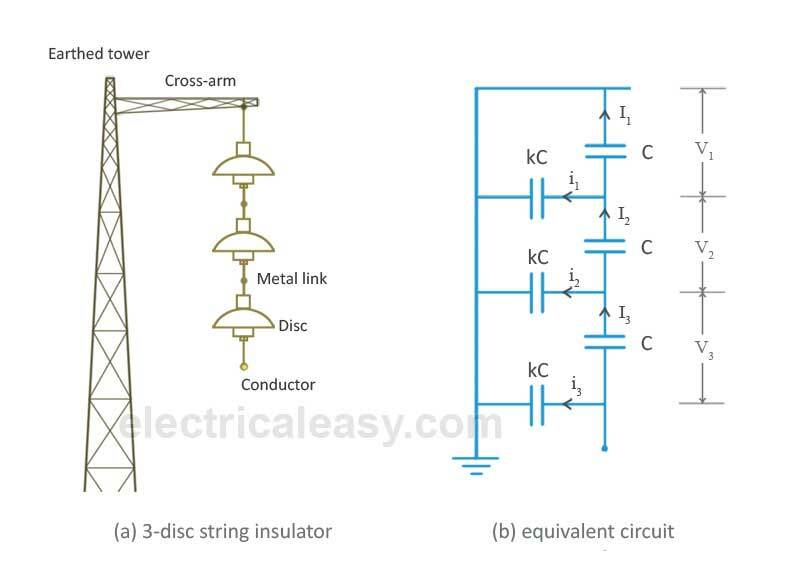 String efficiency = Voltage across the string / (number of discs X voltage across the disc nearest to the conductor). Greater the string efficiency, more uniform is the voltage distribution. String efficiency becomes 100% if the voltage across each disc is exactly the same, but this is an ideal case and impossible in practical scenario. However, for DC voltages, insulator capacitances are ineffective and voltage across each unit would be the same. This is why string efficiency for DC system is 100%. Inequality in voltage distribution increases with the increase in the number of discs in a string. Therefore, shorter strings are more efficient than longer string insulators. It is clear from the above mathematical expression of string efficiency that the value of string efficiency depends upon the value of k. Lesser the value of k, the greater is the string efficiency. As the value of k approaches to zero, the string efficiency approaches to 100%. The value of k can be decreased by reducing the shunt capacitance. In order to decrease the shunt capacitance, the distance between the insulator string and the tower should be increased, i.e. longer cross-arms should be used. However, there is a limit in increasing the length of cross-arms due to economic considerations. In this method, voltage across each disc can be equailized by using discs with different capacitances. For equalizing the voltage distribution, the top unit of the string must have minimum capacitance, while the disc nearest to the conductor must have maximum capacitance. The insulator discs of different dimensions are so chosen that the each disc has a different capacitance. They are arranged in such a way that the capacitance increases progressively towards the bottom. As voltage is inversely proportional to capacitance, this method tends to equalize the voltage distribution across each disc. A guard ring or grading ring is basically a metal ring which is electrically connected to the conductor surrounding the bottom unit of the string insulator. The guard ring introduces capacitance between metal links and the line conductor which tends to cancel out the shunt capacitances. As a result, nearly same charging current flows through each disc and, hence, improving the string efficiecy. Grading rings are sometimes similar to corona rings, but they encircle insulators rather than conductors.